This is a review I’ve been looking forward to writing for a long time since Suicide Squad has been one of my most anticipated movies of 2016. A lot of my hopes for a really good modern DC live action movie was almost completely destroyed after seeing Batman v. Superman earlier this year. It was a muddled mess of a movie that was far too long and didn’t have enough in the ways of story or entertainment. Based on the large majority of reviews I’ve seen about Suicide Squad, I was ready to accept that this was going to be another stinker. Fortunately, and despite what seems to be the popular opinion, I had a really good time with this movie even with all of its glaring, painfully obvious flaws. With supernatural beings and metahumans becoming more known, government agent Amanda Waller (Viola Davis) creates a special ops unit called Task Force X, aka the Suicide Squad, to complete missions that are to sensitive and controversial for official branches to handle. 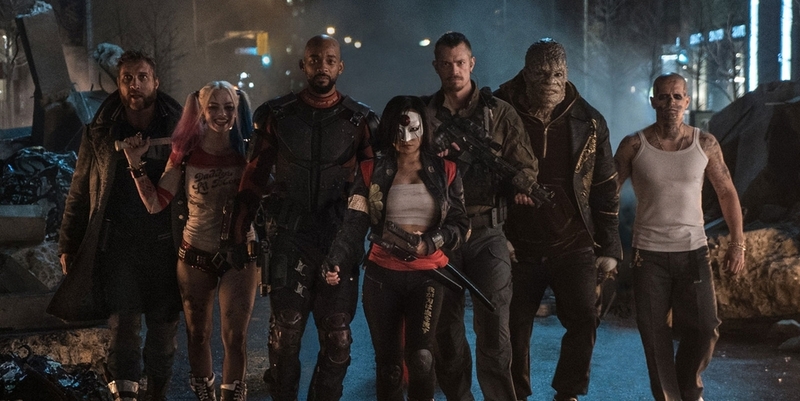 This squad is made up of expert assassin Deadshot (Will Smith), the beautifully dangerous psychopath Harley Quinn (Margot Robbie), the mutated Killer Croc (Adewale Akinnuoye-Agbaje), Australian thief Captain Boomerang (Jai Courtney), former gangster El Diablo (Jay Hernandez), martial artist Katana (Karen Fukuhara), and loyal soldier Rick Flag (Joel Kinnamen). 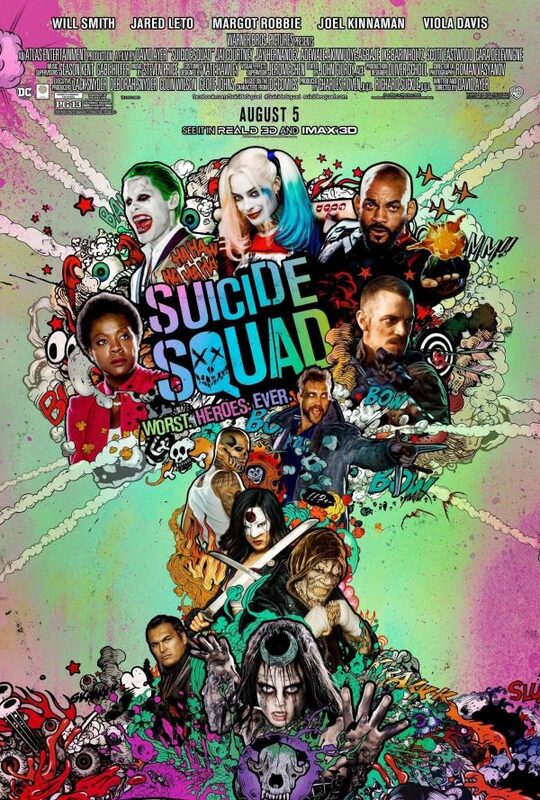 While hosting a plethora of differences in opinion, technique, and beliefs, this unlikely crew must band together to stop the overwhelmingly powerful abilities of the Enchantress (Cara Delevingne), whose main goal is to once again have the human race fear her, while also keeping the anarchic doings of the Joker (Jared Leto) in check. I want to get the obvious problems with this movie out of the way, because while I liked this movie overall, there are some pretty large mistakes that were made. For one thing, some of the dialogue is beyond stupid. We all understand that the Suicide Squad is made up of villains. The characters didn’t have to refer to themselves as “the bad guys” multiple times throughout the movie. If they did it once, that would’ve been fine, but they said it over and over again. That’s just one example of the writing. A lot of the characters are also extremely underutilized. The little bits we got of Captain Boomerang, Killer Croc, and Katana were all really cool, but they never actually end up doing much of anything in the movie, which is very disappointing. How can you make a movie about an entire squad of characters and not give every member their time to shine? Enchantress also doesn’t work too great as a villain, and my main reasoning for this is that she doesn’t really interact with any of the members of the Suicide Squad until the very end. I like a villain that has a very known and active presence, and Enchantress just didn’t command the screen like she should have. Now that all that gross stuff is out of the way, I can talk about what made Suicide Squad as fun as it was. The characters that do get attention all knock it out of the park. Viola Davis is menacing as Amanda Waller, and was easily one of the most interesting characters in the entire movie. Will Smith, Margot Robbie, and Joel Kinnamen also are spot on with their roles, and I was surprised that these characters actually develop very well individually and also in their relationships with one another. Character development was something Batman v Superman really lacked, so luckily this movie picked up the attention to detail a little bit. Jay Hernandez was surprisingly a really great character and might actually be the most fulfilling character, rivaled only by Smith’s story arc. Finally, everyone was curious what Leto was going to do with the Joker, and I’m relieved to say that he has taken the character and really made it his own. This is a Joker that’s taken lessons from cartel members, while also making Arkham Asylum his getaway of choice. He stole every scene he was in and I can’t wait to see more of him. One of the most important things a movie can be to me is entertaining. It’s great if a movie looks beautiful, has deep themes and strong characters, but if it fails to draw me into it what’ the point of even watching? More than any of the flaws Suicide Squad had, it had me entertained for most of the run time. There was plenty of action, more humor than the DCEU has yet to see, and an overabundance of energy that kept me into the story and the action. I hate to keep referring back to Batman v Superman, but indulge me. That movie had action and energy at moments, but there was so much muddy stuff to get through that by the time things were starting to pick up that were relevant to the story, I was already tired of it. Suicide Squad was a much more compact movie and every scene had a place and significance. While the middle of the movie got a little slow and drawn out, it soon found its way again and the flow of the plot resumed normally. If a movie can hook me, it’s already done a very important job. I can see why a lot of people may not like this movie considering it has a lot of obvious problems with the writing and some of the characters. That being said, I can’t really understand all of the hate that being thrown at it. Suicide Squad isn’t a perfect movie, but, to me, it was a whole lot of fun. There’s plenty of action, good humor, and a strong sense of style. Comparing it to Man of Steel and Batman v Superman, Suicide Squad might be my favorite entry in the DCEU to date. If the characters were written better and the story was tweaked a little bit, this movie could have been something great. As it stands, it’s an entertaining summer movie that I’d love to see again.